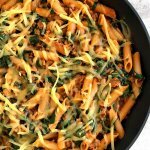 I remember the very first time I made a pasta dish all in one skillet a few years ago. I had no idea that was possible until I saw a recipe for a self-saucing pasta over on the Mediterrasian website. It was so amazing to be able to do everything all in one pot. No waiting for a big pot of water to boil or having to clean an extra pot. So awesome! 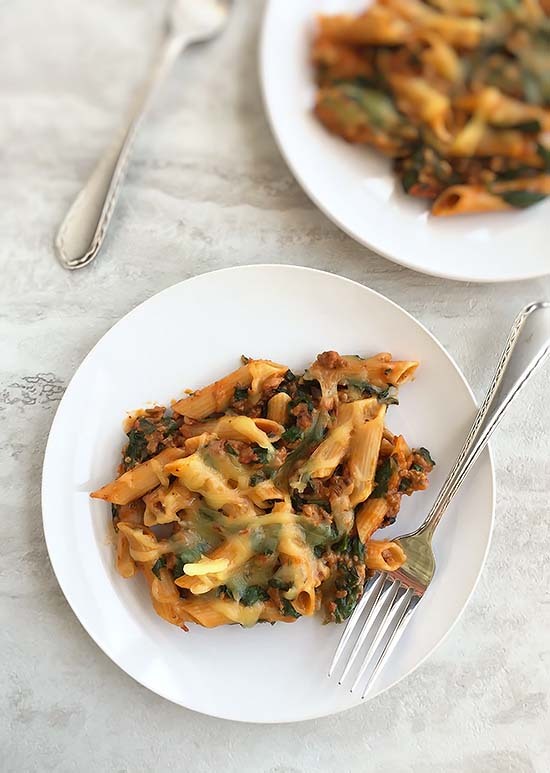 This one-skillet Penne with Sausage and Spinach recipe follows a slightly different approach in the cooking process, but both result in an excellent dish. Although, I may have liked this version slightly better. This method is one that I got out of The Best Skillet Recipes cookbook from the people at Cook’s Illustrated. Love that book, and I highly recommend it. Even though it doesn’t have any pictures, which is usually a deal breaker for me with cookbooks. Apparently, I’m willing to make a few exceptions here and there. I used a brown rice pasta from Jovial Foods for my dish, which is another item I recommend. I’ve tried a variety of brands, and I really like this one. It didn’t get all mushy like some gluten-free pastas I’ve tried. The cooking time may vary depending on the type of pasta used in this dish. 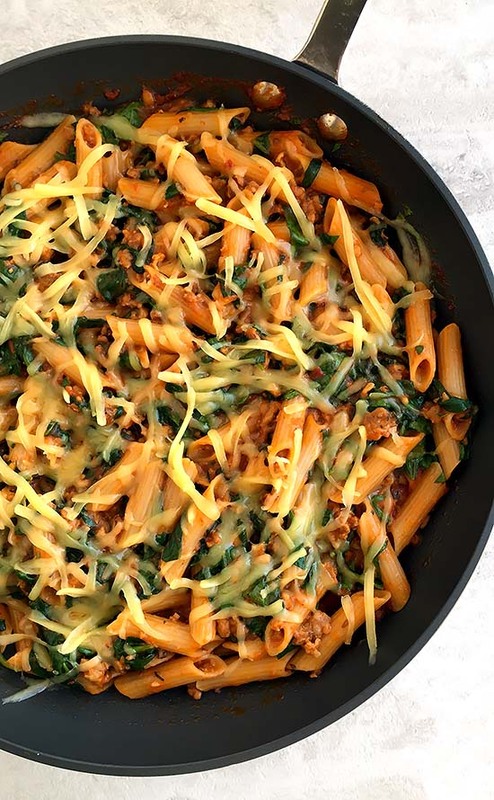 You may want to start checking the pasta for doneness after it has been cooking for a bit. In a 12-inch non-stick skillet, heat the olive oil over medium-high heat until you begin to smell the oil. Add the chicken sausage and cook, breaking the meat apart with a spoon or spatula until it's browned. Stir in the garlic, fennel seed, italian seasoning and crushed red pepper flakes. Stir in the tomatoes, water, 1/2 tsp sea salt, then add the pasta. Raise the heat some and stirring often, cook at a vigorous simmer until the pasta is tender and the sauce has thickened, about 15-18 minutes. Taking a handful at a time, stir in the chopped spinach and cook until it has wilted. Top with the mozzarella cheese and serve. It's very important to stir the pasta often because it really will stick to the pan. Cooking times may vary depending on the type of pasta used. I used brown rice pasta in mine.